Tabitha is a teddy-doll hybrid and is 39cm tall from feet to tips of ears. Her head is made of clay and painted using acrylic paints. Tabitha has blue Lauscha glass eyes, which I believe are the best. I have used light pink faux fur to give this wonderful fluffy look, and neutral faux doe suede for the paws and ears. For filling I used Fiberfill and glass beads. I have given her a reasonable weight of nearly 1kg, whilst being soft and cuddly. Tabitha has cotter pin joints in her head and limbs, which allow her to be posed. Every kitten should have a tail. I have given it a beautiful shape and not-too-hard feel. Tabitha is so lovely to hold. She is a delicate baby, who hopes to be loved. If you are interested in buying Tabitha please contact me. 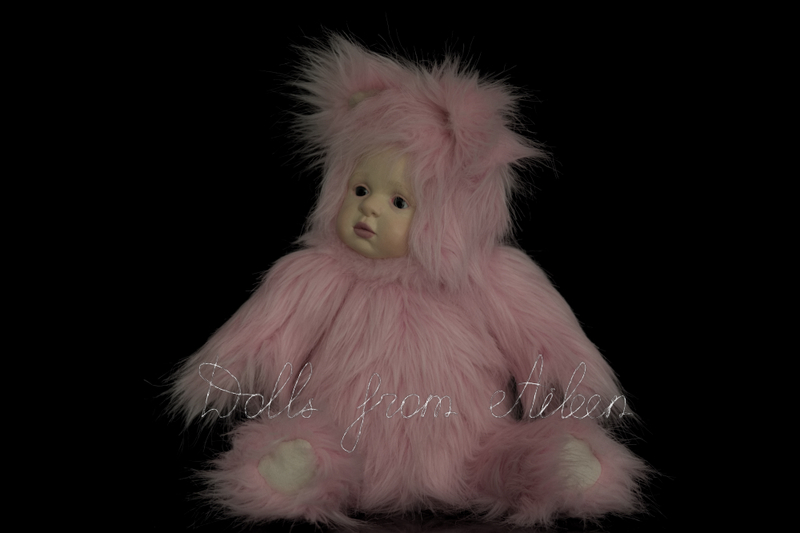 Please note: my dolls and teddys are artworks and not intended for children. This is a video showing Tabitha being posed.